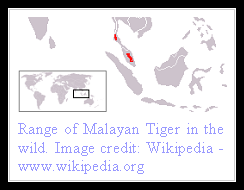 Malayan Tiger of the Malay Peninsula was only recently discovered as a separate subspecies. Previously considered as part of the Indochinese Tiger, it was in 2004 after an year of extensive DNA study that it was declared as the sixth extant subspecies of tiger. Named Panthera Tigris Jacksoni after Peter Jackson, the former head of cat specialist group of IUCN who spent forty years in tiger conservation efforts, it is now alternatively called Panthera Tigris Malayensis by some after Malaysian protests that the name should reflect the area of the big cat's origin. Similar in physical appearance to the Indochinese Tiger, the Malayan Tiger is closer to the Sumatran Tiger in size. Males weight around two hundred and sixty pounds and females are on average two hundred and twenty pounds in weight. Average body length is seven and a half and six and a half feet respectively for males and females. Coat is dark red to orange in coloration, marked by thin black stripes. Belly, cheek and area around eyes is white. Whiskers are somewhat long and so is the tail. Overall body is muscular. Not much is understood about this big cat except that it resides mainly in tropical forests and grasslands of Malaysia and Thailand. It is known to prey on barking deer, sambar and wild boar as well as sun bear in certain parts of its range. The cat is thinly distributed in their habitat owing to low prey density. Little is known about its behavior patterns and reproductive profile. 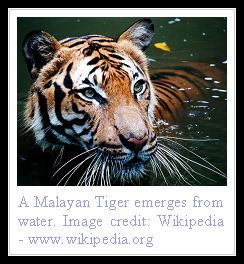 There are between five hundred to one thousand Malayan Tigers left in the wild. Threats include habitat fragmentation and shrinkage, poaching, conflicts with humans and decline of prey species. Even as Malaysia enforces a rigid control on poaching that has cut down the loss of tigers to an extent, many of the Malayan Tigers live outside the designated forest reserves, often bringing them into conflict with farmers. Malaysia however has a very successful captive breeding program, raising some home for this beautiful feline which is currently classified as Critically Endangered. I have a malayian friend! This is awesome info for my research! Love it!!!!! I'm 13 and I love doing research on any animal I can find. Especially tigers! We leading company engaged in offering best Packing and Moving Services to our clients. We safely and timely help you to shift your belongings and vehicles. We believes in the philosophy of making a long-term relationship and not in a discrete transaction. Our online essayists are master in composing task. Our specialists give the dependable assignment help UAE administrations to the understudies. this is the best green juice.It helps in getting better overall health. Its very authentic blog post, I love it.